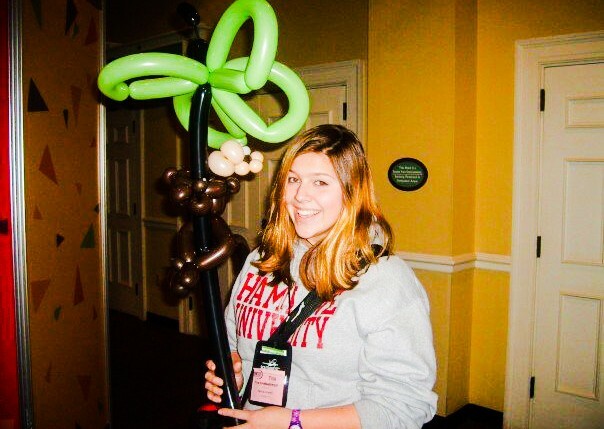 When I moved into the sorority house for the first time, I had no idea what I’d gotten myself into. I told you my story this summer, about how I was kind of terrified to live with 30 women. Living with sorority women was an experience I had only been able to prepare myself for through stereotypes. And now, here I am 3 years later, a sorority woman who works with sorority women for a living. Who’d have seen this coming? Not me. Because I had no idea I was being recruited. The reason I’m a sorority woman today is because my sisters understood something I didn’t: people don’t join sororities; people join people. This post is meant to help you find ways to consistently build and deepen relationships with non-Greek women year-round. I’ll share a bit more of my story, and then provide some practical tips for you below. Knowing what I know now, knowing that people join the relationships they make and the way those relationships make them feel, I can pinpoint the exact moment I started to think sorority might just be a place I belong. About one week into living in the house, I had finalized the list of things I still needed to grab from Walmart. I didn’t yet have a car on campus, and was in the process of looking up the bus schedule to get to the store and back when there was a knock on my door. Three of the ladies in my house were about to head to Walmart for a move-in run and wanted to see if I needed a ride. Better than the bus, right? I was in the car for maybe 5 minutes before I realized this was not going to be like any other shopping trip in my life. The radio blasted some old school N’Sync songs while each of us sang at the top of our lungs and danced like no one was watching. In between songs they asked me questions about my life in grad school and what Minnesota was like. Once in the store, they grabbed carts and began moving through the store, aisle by aisle, each of us finding something new to giggle about on each shelf. They helped me find cute curtains and pillows, and I helped them pick out school supplies. And we laughed. We laughed the whole time. That trip to Walmart, and countless other stories like it, is how I was recruited. Those silly trips, late night chats, dinner conversations and coffee runs are what changed my mind about sorority. Those women showed me friendship, love, laughter, kindness, fun and purpose—they showed me their values, their sisterhood, simply by inviting me into it. By spending time with me in ways they were already going to spend time together, they brought me into their world. They recruited me. And, I promise, it doesn’t have to happen during a trip to Walmart. Here are 10 fun things you can do with your sisters and your non-sorority friends—anyone you’d like to have an amazingly fun time with to deepen relationships (THIS is what sorority recruitment could look like for you). 1) Spend an afternoon at a museum: What a fun way to get out of the house! Many museums around town will have a day each week or month where you can get in for free, or donations. Giving back while having great conversations with friends in a classy place? I’m in. 2) Take to the outdoors: Grab your lunch, and go sit outside at that picnic table. Take a blanket from your room, your friends and some homework. Instead of chatting over coffee in the busy coffeeshop, take your drinks out for a nice walk. Mix up the routine and add some sunshine (weather permitting, of course). 3) Get baking: a few friends, flour, sugar, eggs, chocolate chips, etc. = recipe for a fun and delicious evening! Sit around with your friends and get to know each other while baking your favorite treats. Bonus: everyone gets to take home something delicious. 4) Take an exercise class together: The first time I took a Zumba class with my girlfriends, I think I was more sore the next day from laughing so hard than actually working out. These kind of adventures are the making of some of the best stories — ask my sisters about the one where I fell over during Zumba. True story. 5) See a bad movie: Sit in the back of an empty theater and whisper about a terrible movie (as long as it’s not distracting other viewers, of course). Otherwise, there’s nothing wrong with seeing a great movie with a great-looking cast. Sounds like good times either way! 6) Can we go thrift shopping? : Definitely. Looking for costumes for the next event? Or a vintage version of that jacket you saw in InStyle last week? Take some friends and an open afternoon to cove through the thriftshops around town. Be sure to have Instagram and Snapchat ready! 7) Homeworking at the coffeeshop: We’ve got to study, right? Why not do it in a place where we can also be a bit social with one another? Find a coffeeshop close to campus and camp at a big table for the day. Even school’s more fun with just girls. 8) Go to an event: …but not a fraternity or sorority event. Grab a few friends and go check out a program being put on by a different campus organization. Maybe one of your sisters has a dance team performance or a soccer game. Maybe you’ve never been to a student government meeting. A play on campus? The cultural student organization is having a food night? Perfect. Bring a new friend and get involved on campus. 9) Spend an afternoon on Netflix: Because let’s face it — we’re going to do it anyway. Might as well invite over a few sisters and friends, and kick it old school with a marathon. Friends? Boy Meets World? Buffy the Vampire Slayer? High School Musical(s)? Gossip Girl? Golden Girls? Don’t forget the popcorn. 10) There’s always room for brunch: Brunch is one of my favorite things to do with my girlfriends. Whether we go out or make it at someone’s house, we catch up about each other’s lives, tell stories and share laughs. It’s almost like an adult version of the slumber parties we had when we were little girls. But with delicious breakfast food. That’s just a few ideas. I bet you’ve got more. Tell us about them! 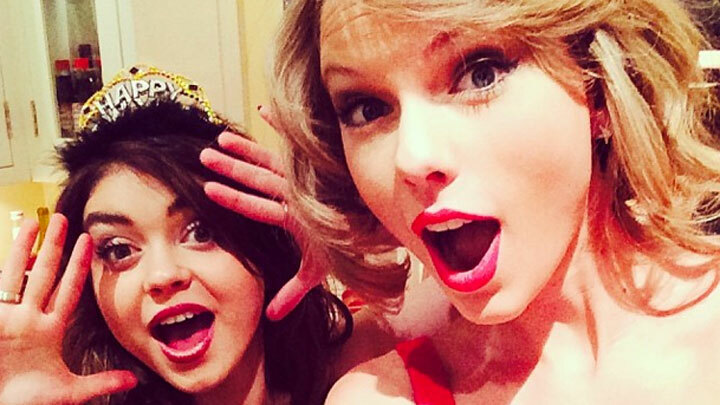 Share this blog, and with it your favorite thing to do with your girlfriends. Especially the girlfriends you think might make great sisters some day. Fun note: this blog was inspired by/brazenly borrowed from a funny moment when Matt Mattson, Phired Up co-founder, admitted to reading this article. Credit for the photo goes to Cosmo, obviously. I played hockey for 11 years. Early on in my career I got my first shutout as a goaltender, a proud moment in any goalie’s life. Throughout the game I had the song “Chop Suey” by System of a Down stuck in my head. Every game following that, for multiple seasons, I made sure that I sung that song in my head. A funny thing happened. Every single game I played after that, I got a shutout. Just kidding! It literally had no impact on how I performed. But it didn’t stop me from listening to that dang song over and over and over. We’ve all had a superstition at one point in our lives. From not stepping on sidewalk cracks because they would break our mothers backs. To knocking on wood to prevent future mishaps. To not telling anyone your wish after you blow out your birthday candles so that they come true. Much like my own superstition. Stepping on a crack never broke mother’s back. Knocking on wood does not act as a preventative measure. Telling someone what you wished as you blew out the candles never had an effect on the outcome of that wish. And yet, somehow, we still feel compelled to take these actions because we believe they have a direct effect on an outcome we want or don’t want. Now back to the question. Is your chapter superstitious? Here’s why your recruitment process probably looks the way it does today. Somewhere along the line, one of your members had or saw an unusually great recruitment success within their own chapter or another chapter on campus. They then took a look at what they did during that period and attributed SOMETHING that they believed to be the cause of their success. Whether it was that they hung an abnormal amount of flyers, or whether it was because they had a brother that year with particularly good BBQ skills, or maybe a sister planned the most amazing decorations for a certain round or recruitment, or whether it was because they had particularly special Rush shirts that year. The trouble is that those actions, much like crack stepping, candle blowing, or listening to “Chop Suey” may have nothing to with that success. 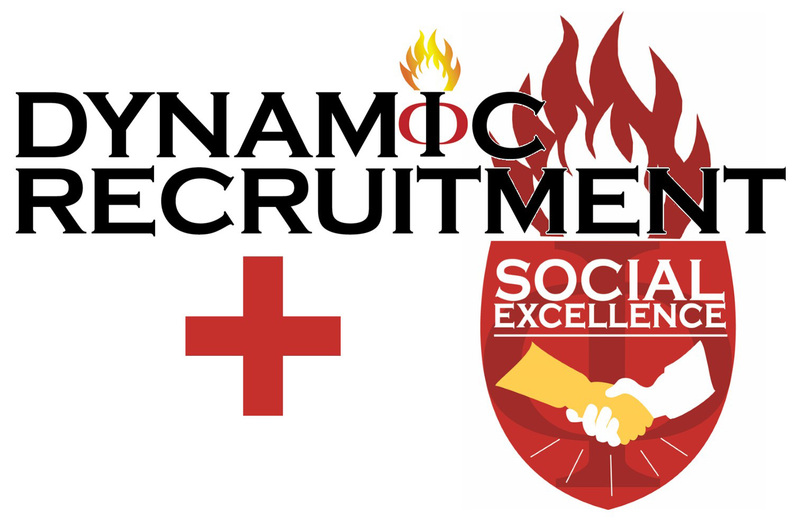 We can improve our recruitment processes, we just have to question our own organization’s status quo. Take a look at your recruitment process. Which parts are the REAL cause of success and which are just superstition? Sometimes it is hard to tell what is really the cause of your recruitment results. But we know from lots of experience, research, and practice that the actual cause of recruitment success is typically about relationships, people, and personal connection. The talismans we often give credit to are rarely consequential in the grand scheme of things. Want to recruit ridiculously well this year? There are lots of things we could teach you that would help you do that. But you want a simple, easy-to-remember, results-producing idea that will really get results, don’t you? O.K. I’ll give it to you. Do this one thing this year and you’ll experience a higher quantity of higher quality people who desire to be a part of your organization. 1. Measure how many “points of contact” your members normally have with non-members. That’s it. 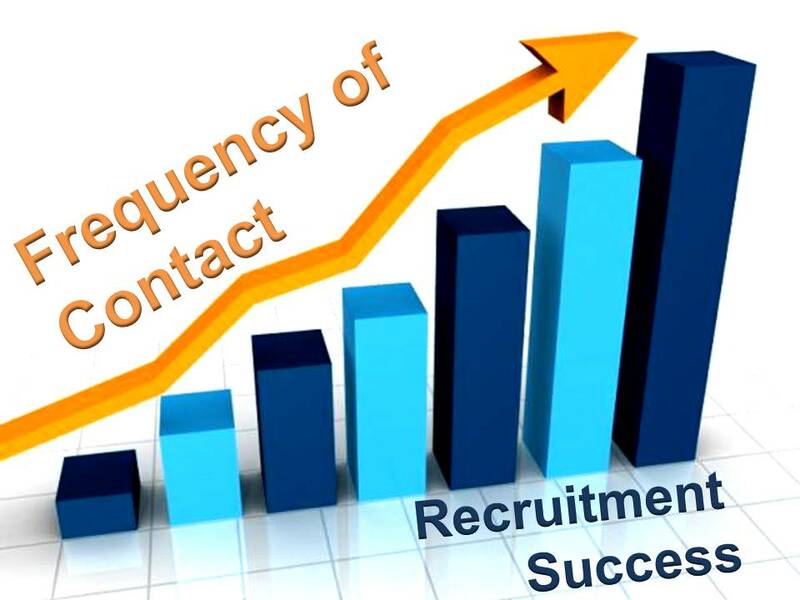 I truly believe recruitment success might come down to something as simple as what I call, “FREQUENCY OF CONTACT .” How frequently do your members talk with, E-mail, text, shake hands with, eat lunch with, invite, ask questions of, engage in 1-on-1 meetings with, walk together to class with, call, interview, present to, wave “hi” to, or have a real meaningful conversation with non-members ? If you increase your members’ frequency of contact with non-members, you’ll get better recruitment results. That might sound really overly simplified. Whatever. Just try it. See what happens. More Contact = More High Quality Members. 1. Professionalism is important on social media platforms, but don’t be afraid to give your chapter some personality. Engage your followers and friends through likes, retweets, replies and favorites. Don’t become the chapter that only posts on holidays (I’m guilty of this at times). 2. When taking pictures, consider that potential new members won’t know or necessarily care WHO is in the pictures. They are interested in what it is you DO. Rather than just posing for a group picture with your letters at the end of an event, take photos while it’s going on. Show your members doing community service, talking to other students, laughing together, etc. Candid photos are what make tabloids thrive (but in our case, we want them to be at least somewhat flattering). Don’t be the chapter that only takes selfies. 3. Speaking of pictures, it’s 2014. Film is more than a century old! Now, a majority of students have powerful, HD-capable video cameras right in their pockets. They say a picture is worth a thousand words so just imagine the power of 24,000 words per second (that’s a film joke, get it?)! You can tell a lot more of your chapter’s story with a minute of video clips than you can with a minute of pictures. 4. SHOW, don’t TELL. One of the things I dread the most in recruitment videos are the snooze-inducing interviews that make up some of them. We live in the age of the internet. Attention spans are shorter than ever, case in point: Vine. Unless you are a phenomenal public speaker or storyteller, on-camera interviews are an easy way to bore people. Use your time wisely, show a clip of your lip-sync dance or that crazy water-balloon social you had two weeks ago instead of giving the same textbook answers they hear from every other recruitment video. Remember that your job is to continue building a relationship, not to start one from scratch. Your chapter’s social media isn’t going to Catfish potential new members into joining, but it can give them more insight into what your chapter is about. Want to grow your fraternity or sorority? There are a thousand things that can distract you from the important stuff that actually gets results. Our job is to help you remember to stay focused on what gets the results you want. Whether it’s quantity, quality, or (probably) both, we know that growing your organization requires CONNECTIONS and STRATEGY… in other words, the art and science of organizational growth. The ART of Organizational Growth: Social Excellence. The art side of what we teach is less about what you do, and more about who you have to become. Become an artist in the social realm. Connect with people’s emotions and who they really are through authe nticity, curiosity, vulnerability, and generosity. Create a work of art through genuine connections with real people. 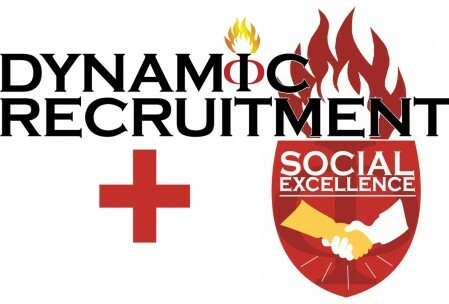 Social Excellence is about being a great recruiter. It is about who you are. It is about choosing to live a lifestyle and being the best version of yourself. This is not science, it is art. Phired Up will continue to develop educational products and services to teach both the Art and Science of Organizational Growth. We teach what you have to DO and who you have to BE. Sometimes when we deliver training on campuses, for councils, to chapters, or at conferences, it makes sense to deliver these separately. Sometimes they need to be combined. But to understand the big picture of how to build a membership organization that is world class, first understand that there is an art and a science to it, and both are required.